These days, most expectant parents take for granted that they’ll get a first glimpse of their unborn child through an ultrasound months before the baby actually arrives. For many moms-to-be, it has become a cherished part of the bonding process. But mothers who are visually impaired haven’t been able to share the experience — until now. A video posted on YouTube by the Brazilian branch of the Huggies diaper company shows the emotional moment when a blind woman got to “see” her unborn son for the first time, thanks to 3D printing technology. 30-year-old Tatiana Guerra lost her sight at the age of 17. In the video, she arrives for an ultrasound during her 20th week of pregnancy. At first, the doctor describes what he sees. 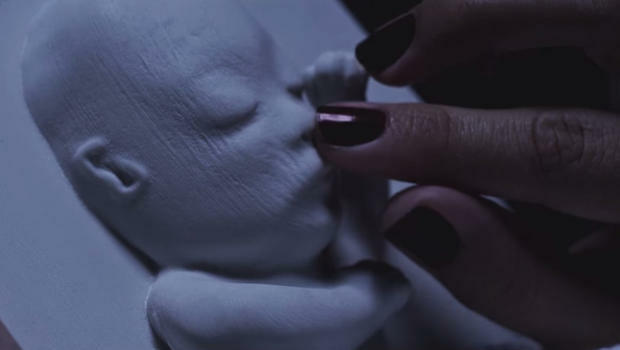 Then a 3D printer converts the ultrasound image into a relief sculpture of the baby’s face, and Tatiana dissolves into tears as her fingers trace the features of the son she plans to name Murilo. Closeup of mother-to-be Tatiana Guerra touching the 3D-printed sculpture made from an ultrasound of her unborn son. Ultrasound machines that produce high quality, three-dimensional images are becoming increasingly popular. Doctors say they are safe, although the FDA has warned against using them for non-medical purposes just to create keepsakepictures of unborn babies.